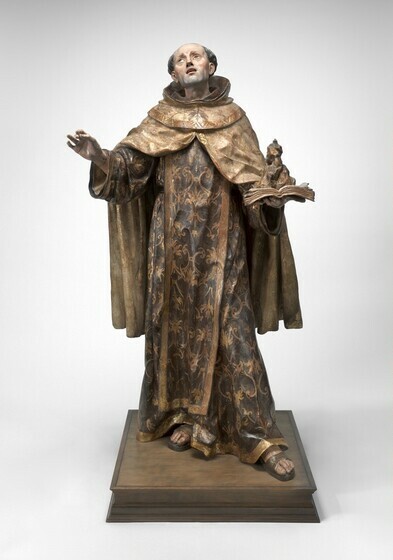 The polychromed wooden sculpture, which depicts the 16th-century saint known as John of the Cross, has recently undergone technical examination and conservation treatment by the object conservation department at the National Gallery of Art in Washington, DC. Saint John of the Cross was a Spanish monk and priest born near Ávila in 1542, who during his lifetime founded an order of reformed Discalced Carmelites. ("Discalced" means barefoot or wearing sandals.) He was also a mystic and poet. Having worked briefly in his youth in a sculptor's workshop, John wrote of the necessity of sculpture to inspire reverence for the saints. To mark his beatification in 1675, when John was proclaimed worthy of public veneration in preparation for sainthood, the Carmelite convent in Seville commissioned this sculpture of him undergoing a mystical experience. Originally, a dove, symbol of the Holy Spirit, was attached to his right shoulder, while in his right hand he would have held a quill, poised to record his vision in the book he holds in his left hand. The miniature rocky mountain on top of the book alludes to the title of the saint's celebrated spiritual treatise, Ascent of Mount Carmel. Francisco Antonio Gijón was a sculptor from Seville renowned for his ability to carve dramatic works with intense expression. He was only 21 when he was awarded the commission. During the technical examination, x-radiography revealed that the main body of the figure was carved from a single column of wood hollowed at the back from mid-chest down to the base in order to reduce its weight and minimize cracking along the grain. The radiographic evidence—in addition to subsequent identification of the wood as cypress—corresponds to details of a document in which the artist, Gijón, was commissioned to produce a sculpture of Saint John of the Cross, and specifies that a cypress log would be provided for his use. Examination of the sculpture's surface and the x-radiograph revealed that the head, arms, hand, left leg, and both feet, as well as the cape, hood, and lower scapular portion of the monastic habit were all separately carved and attached to the trunk using animal glue and nails. The neck was carved with an extension shaped to fit into a hollow in the top of the trunk. Extra sections of wood were attached to the main column to accommodate the figure's expansive stance. Each hand of Saint John of the Cross was made separately with a carved tenon (insertion piece) projecting from the center of the truncated wrist so that it could be fitted into the corresponding mortise (opening) at the end of the forearm. The schematic drawing illustrates the process of transforming the bare wood surface to its gilded and decorated final appearance. A team of specialists was involved in making the original sculpture. Traditionally, the sculptor carved the work and applied a white ground. Flesh tones of the head, hands, and feet were then applied by a painter. It was common for yet another artisan to embellish the drapery with estofado (gilded, painted, and scribed decoration). Here, conservators in the laboratory demonstrate the application of glue and linen to cypress wood panels. The preparation of wood surfaces for estofado, a special technique used to decorate the drapery, was more time consuming than that for the encarnciones (flesh tones). Following an overall application of gíscola (animal glue and garlic essence), the surfaces to be gilded were covered with linen. This covering reinforced the separate wooden elements, isolated wood knots, and provided a rough surface to hold the subsequent layers of gesso. The strength provided by the fabric precluded the need for numerous expensive metal nails, which had the disadvantage of corroding and eventually causing the wood to crack during seasonal weather cycles. [right] Conservators paid considerable attention to maintaining a smooth surface in between each layer, contributing to a final surface that was as smooth as possible. [bottom] Next, gíscola was brushed over the fabric-covered surface, followed by four to five layers of warmed, glue-fortified yeso grueso (coarse gesso). Finer yeso mate was applied over the yeso grueso with a light hand in a continuous succession of several thin layers. Once dry, the bol (bole, or clay mixed with animal glue) provided a relatively tough but pliable surface on which the gold leaf could be scribed, impressed, or burnished. The final layer was attentively polished, since this was the surface upon which the gold leaf would be laid, and imperfections would be magnified by the gold's reflection. After dampening the bole with water to activate the glue, individual gold leaf sheets were floated onto the surface and gently set down with a soft brush to work out any air bubbles and allowed to dry. The surface was then worked with a burnishing stone to a brilliant sheen. The brilliant golden surface was brushed with thin layers of the egg tempera paint. In anticipation of the final steps for creating the estofado design, tempera paint was prepared by mixing diluted egg yolk with pigment. [right] The pattern is transferred to the tempera surface with chalk to act as a guide for scribed lines (left side of panel). The matte surface of the tempera paint provides maximum contrast to the brilliant gold below (right side of panel). [bottom] An intricate estofado pattern is revealed in gold as the tempera paint is removed with a stylus. [right] Bands of intricate punchwork simulating gold trim border the estofado decoration along all of Saint John's vestments. Here, punchwork is added to the fabricated gilded decoration to further enhance the designs. [bottom left] This detail from the drapery of Saint John of the Cross shows its estofado decoration and punched border. Estofado lent an impression of grandeur to the sculpture, which was often glimpsed from afar. A small repertoire of standard patterns elements could be used in varying combinations and sizes. Once the estofado decoration of the robe was completed, the finely carved features of the face, hands, and feet were prepared. The term encarnación (literally, "incarnation" or "made flesh") was used by painters to describe the subtle skill of painting the flesh tones of a sculpture. There were two ways of painting flesh tones: polimento (glossy) and mate (matte). The polimento technique, which involved polishing the surface, made the sculptures look shiny and reflected light in an unnatural way. By contrast, the mate technique was much favored in Seville as a way of approximating the true quality of human flesh. This was the technique used by the painter for Saint John's head, face, hands, and feet. On top of the white ground that covered these areas, the painter first applied a reddish colored priming as a base for the colors. Then, with the skill of a makeup artist, he worked up layers of shadow and texture using an oil-based paint to capture Saint John's angular cheekbones and unshaven chin. The final touch was to apply an egg-white varnish to make the eyes sparkle. The tradition of carving and painting sculpture continues to be popular in Spain today. Darío Fernández, a present-day imaginero (sculptor and painter of sacred images) in Seville, Spain, was commissioned to make a reproduction of the head of Saint John of the Cross to illustrate the process of carving and painting flesh tones. First, a clay model is made to determine the sculpture's proportions, and its measurements are transferred to the wood block. This reproduction was recreated solely from photographs and measurements of the head of the original 17th-century sculpture. [top] Front view: This modern reconstruction bust of Saint John, crafted by Darío Fernández, shows sequential stages of completion in its fabrication. Across the chest, from left to right: bare wood, glue-coated wood, coarse gesso, and fine gesso. [bottom] Back view: the reverse shows of this reproduction sculpture, varying states of completion can be seen from right to left: blocks of wood glued to one another, forms roughed in the wood, and final carved and finished features. Sculptures such as Saint John exist today due to the painstaking technical achievements of the many accomplished artists of Golden Age Spain, whose traditions have been passed down to present-day practitioners.